In some areas of our lives we face giant of fear. Be it overly concern, it is fear. However it is not trying to be courageous that we can take away the fear. When we fear of something we have more faith in the something that can defeat us than in our Abba who can defeat the giant for us. Goliath was mentioned as a champion. It means he has defeated a lot of people before. He has won a lot of battles before. Therefore his people saw him as a champion. Do we have fears that defeated us time and again? 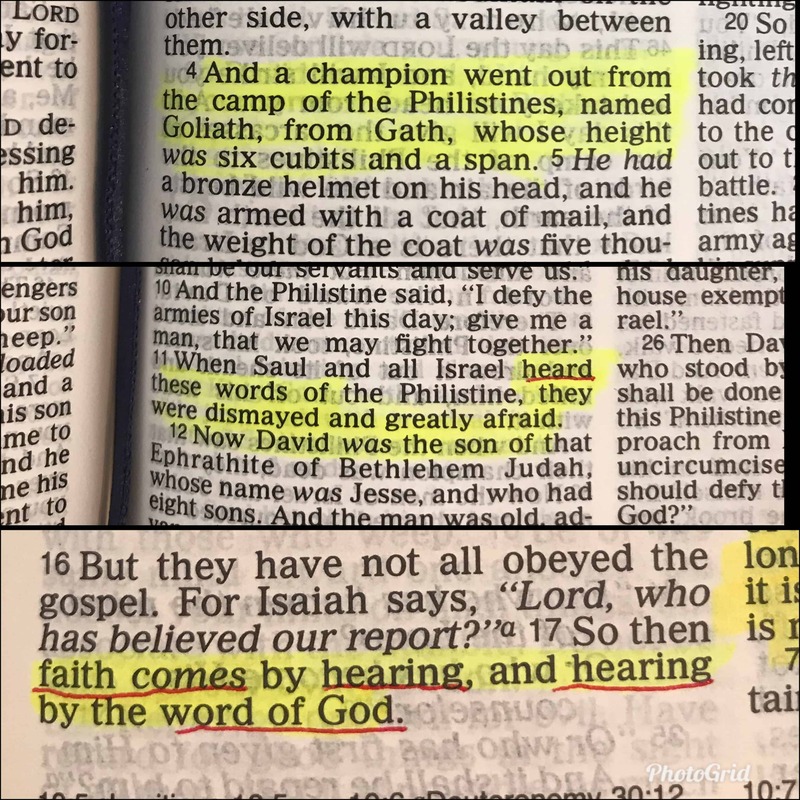 Notice that Goliath keep on haunting the people of Israel with his words? He kept on reminding them they are loser and that they cannot make it. When Saul and all Israel HEARD these words of the Philistine (giant) they were dismayed and greatly afraid. What have you been hearing? Hearing even from yourself? Based on the history i cannot do it. Based on how i scored in the past i cannot. base on the past…the report..
What about base on Jesus’ report? Are we in fear ? Turn our fear into faith by locking our eyes on Jesus and see Him defeat the giants for us! Hear the right thing. Hear Him. Based on His report, we are healed. Based on what He has done, He is the Champion who conquered the battle for us and we are more than a conqueror in Christ!